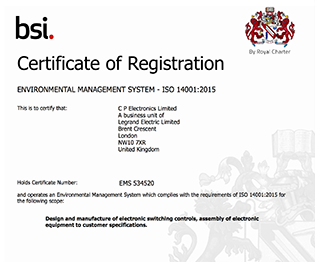 At CP Electronics, we pride ourselves in the high quality and reliability of our energy saving controls. 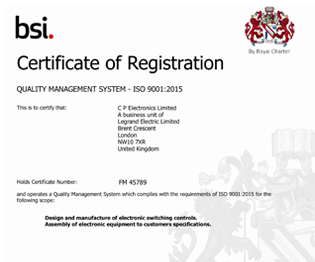 We are members of the Energy Systems Trade Association (ESTA) and an ISO 9001:2015 accredited company with stringent quality assurance procedures. Most of our controls are designed and manufactured in our factory in Wembley, UK, using high quality materials, the latest high-tech machinery and a highly skilled workforce to ensure all products that leave our workshop are faultless and of top quality. The SMD components of each PCB are populated by a state-of-the-art SMT machine, then the lead components follow by hand. Each board is then individually tested in an inspection AOI machine and finally given a manual visual inspection to make sure no fault goes undetected. Our manufacturing and quality management process follows strict test and final assembly procedures to comply with ISO 9001:2015 requirements, and our products carry the CE mark where applicable. We also operate an occupational health and safety management system which complies with the requirements of BS OHSAS 18001:2007.